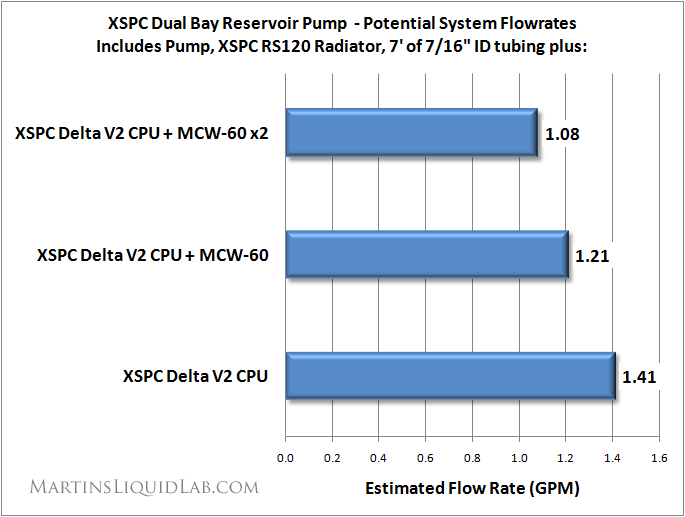 Welcome to my XSPC dual bay reservoir pump review. I would like to give special thanks to Paul from XSPC for yet another great product to review, the products I have tested have all been a pleasant surprise in the amount of attention XSPC gives towards top performance at great prices. They really put 100% into making products that perform well and a true tribute to their commitment in developing products that perform well! 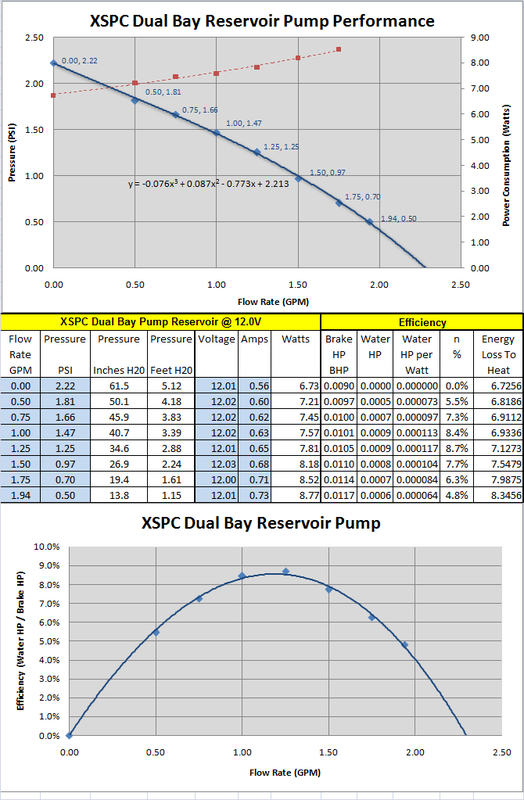 With this review I will focus on the performance characteristics of the dual bay reservoir pump from the XSPC line. 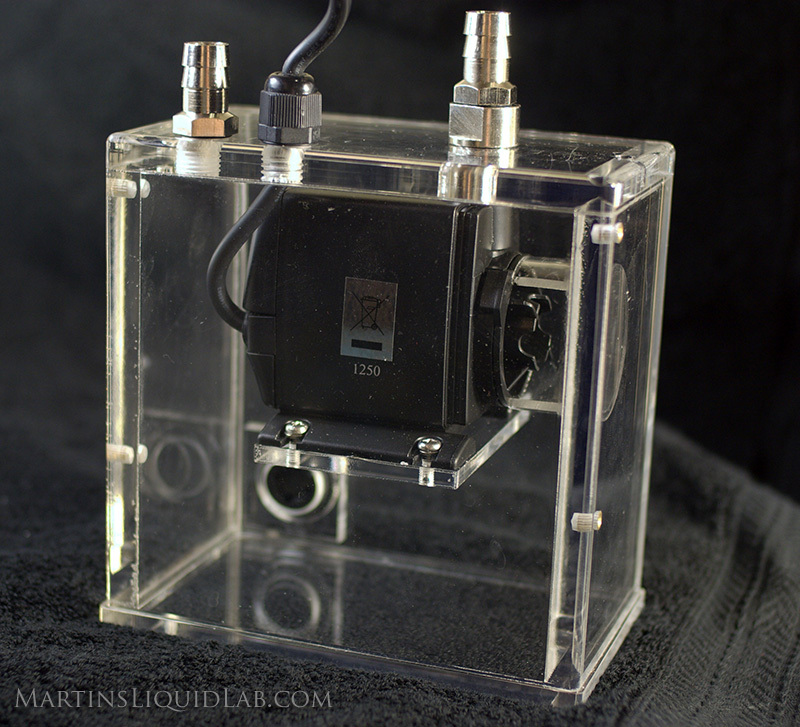 The reservoir pump I'm looking at on this page is a dual bay acrylic reservoir that contains a fairly larger submersible pump in one handy component. This dual bay reservoir is intended to mount like a CD drive so the clear front you see below is completely visible in the front of your case bezel providing a nice visual of your coolant level and pump in operation. The bay reservoir and mounting materials are all made of acrylic and include brass threaded inserts for the bay mounting screws for added mounting durability. The pump also comes with one 12V LED and two locations predrilled for accepting LEDs in the rear sidewalls for additional lighting effects if desired. And here is a side view showing the rear facing barb location and power connection. Inlet barb is on the left then the power connection, and the outlet barb on the right. The inlet barb is nice and low in the reservoir rear wall circulating water completely around the face of the reservoir before returning to the protected pump inlet for maximum air bleeding capabilities. In this particular test the pump was specified to run at 12.0V and likely where most water cooling users would operate it, so all testing was conducted at 12.00V +- .03V. I found the pump would start as low as 5.1V and up to 13.0V and operate just fine. I did not exceed 13.0V for my test, although it would likely go beyond that point. 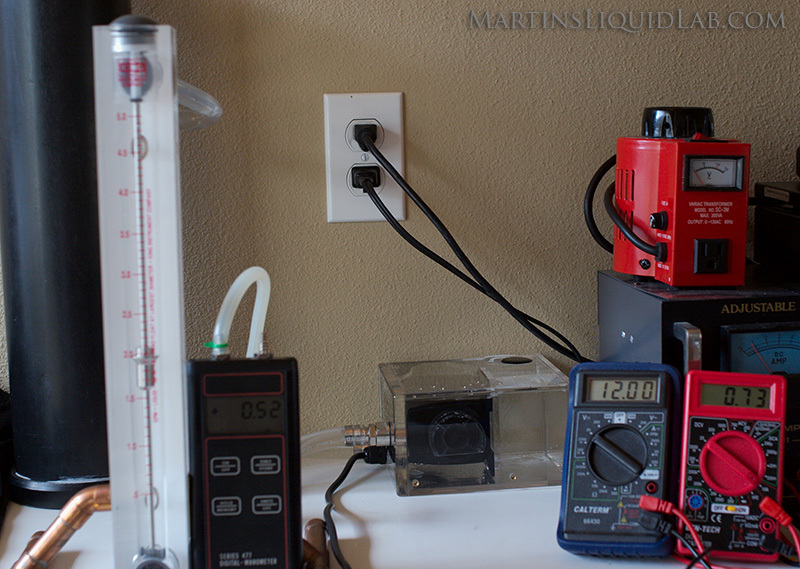 The pump performs very well for the amount of power consumption. It has performance similar to the D-Tek db-1(DD-CPX-1), the Hydor L20, or the Laing D5 at setting 3. The overall efficiency peaks out at around 1.2 GPM so the pump itself is well tuned for water-cooling and utilizing its peak efficiency in most setups. In addition to the pumping power, it should be noted how little power consumption there is on this particular pump. I know several water coolers that utilize a Laing D5 at lower setting intervals like setting 3 for pure silence, this pump would provide a similar performance level in a silent condition and provide a nice large and integrated reservoir. As you can see the XSPC dual bay reservoir pump does particularly well with the low restriction blocks and radiators of XSPC. Even though it's not a pump as powerful as the Laing D5 or DDC 3.2, if you combine the pump with the relatively low restriction components like the XSPC CPU Delta V2 and their RS line of radiators, you can maintain more than adequate flow rates for even multiple block loops and you'll do so at very low heat dump created by the pump. This particular pump also has the advantage of very low heat dump compared to more powerful pumps. So in the end if you select a pump with low heat dump and blocks and radiators with low pressure drop, you can create a very well balanced and efficient system. The key to pumps is to select a pump that has adequate pumping power with minimal heat dump for the selected components. 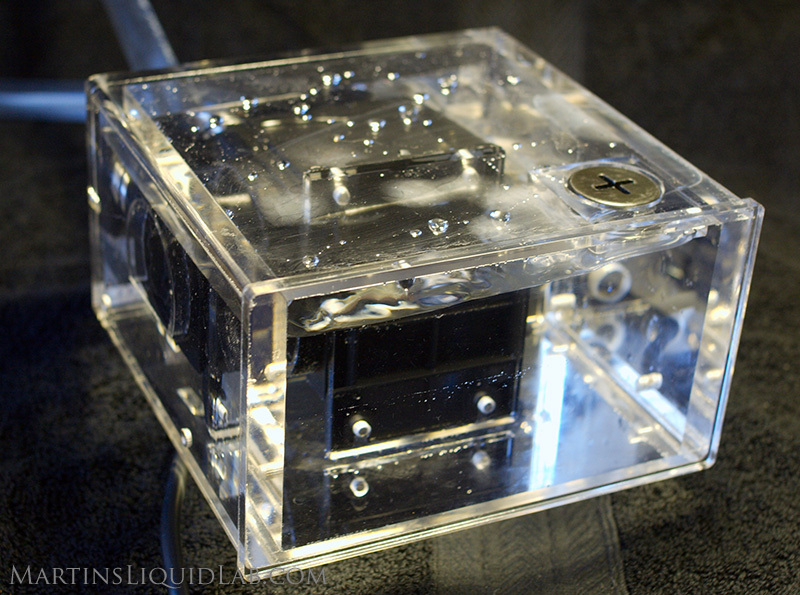 I'm very impressed with the reservoir performance in its ability to remove air bubbles from the system and operate at a large range of depth levels. Most single bay reservoirs have a very small amount of good operational level drop before they start sucking air back into the outlet barb and into the system. Remember air is an insulator so air bubbles are not good in your coolant, so bleeding the system of air and maintain that is an important performance task. Here is a short video of the pump running with my decibel meter running alongside. It's difficult to be empirical with bleeding capabilities and noise, so I'm beginning to do some small video recordings to let my readers make up their own minds on the issue. I recorded this in the evening when it's the most quiet in my house (kids were off to bed), so I hope I've also captured the pump sound for you to evaluate yourselves. The pump was extremely quiet in my opinion with low very vibrations as well, so I suspect this pump would fulfill the needs of even the most particular silence enthusiast. With an average room ambient noise level of 46.7db, after switching the pump on and recording levels about 6" away, the sound level rose to about 49.7 or a 3.0 db total increase. XSPC added a special partial circle scoop over the inlet of this pump that draws flow from the bottom of the reservoir and prevents air from entering the pump even with lower than full levels, very nice addition! You could very easily run the reservoir half empty and still run the system fine without introducing air into the system again. The very large size of the reservoir helps calm waters as they enter and does a excellent job of removing air in a very short period of time. I tested the reservoir and pump at the full range of flow rates and never had any vortex issues, it performed the bleeding duties very very well! I'm very impressed with bay reservoir pump for several reasons. First while it is a smaller pump, it still has plenty of power to run multiple block systems as long as the components are chosen and matched wisely. But more importantly it can do this with very minimal power consumption and with silence. In addition the large dual bay reservoir does a great job at bleeding and can operate with a varied level of coolant so the old problems I've seen with my old bay reservoir would not be an issue here. Also I like the nice large clear front view, it looks nice but it also functions to provide you with a visual on coolant levels and the slight movement in water would indicate all is well with the pump and flow rate is good. Finally the low power consumption and heat dump is very important particularly for smaller radiator systems where it counts the most. The XSPC Dual Bay Reservoir Pump delivers silent performance with extremetly low heat dump and power consumption!